The need for a commercial business to extend their premises has dramatically increased over the last few years. This demand for adaptable space is leading many to look to their immediate outdoor area, which is only ever used when the weather is dry and warm. 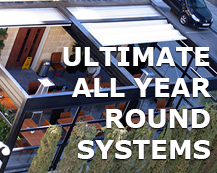 Samson offer a vast range of commercial retractable roof systems. 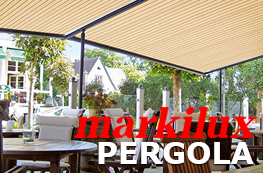 These offer the ability to cover large areas of patio or terrace areas all year round, but with the advantage of being able to retract the roof in the finer weather. 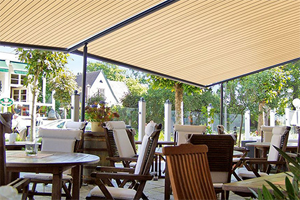 The retractable roof systems we offer are designed to deal with the diverse UK weather, and can be used to their full potential when coupled with elements to protect the sides of your space and when used with heating and lighting accessories. 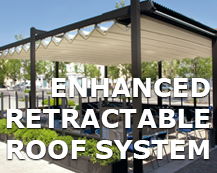 Why Buy A Commercial Retractable Roof System? 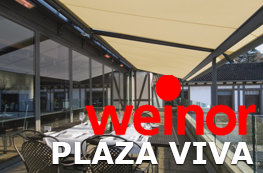 It is a retractable fabric canopy system where rainwater is directed to the front or sides only and the fabric cover is supported and tensioned on all four sides with a framework to support it in higher winds. 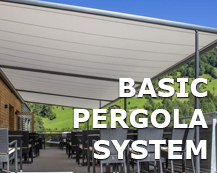 Although basic in operation, this canopy is tough, and can be used in rainy and windy conditions where a normal self supported awning would not be possible. Because it does not have a retracting arm system it is also possible to have larger projections, up to 6 metres and 13.9 metres wide in a coupled system. 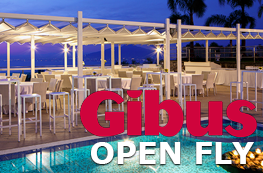 The framework structure is a high quality aluminium with powder coated finishing and always made to measure. They can either be installed directly onto an existing structural wall or steel work or be a stand alone structure, with 4 or more support posts providing the structure base. These systems are ideal for light to medium rain fall and wind speeds up to Beaufort scale 5-6, at which point nobody would want to be outdoors anyway, of course. Samson offer a few enhanced systems. 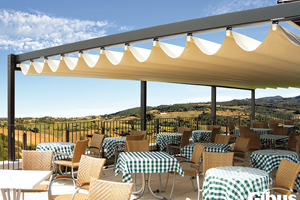 Where a higher level of protection is required and the area is more exposed, the use of thicker fabric covers and additional mechanical components ensure greater resistance to heavier rain and higher wind speeds.Framework systems allow the addition of retractable or fixed side enclosure methods, including vertical blinds and fixed fencing solutions. 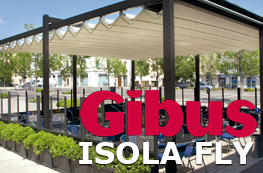 The Gibus Isola Fly is a great example of a system which can either be stand alone or fitted to an existing building. 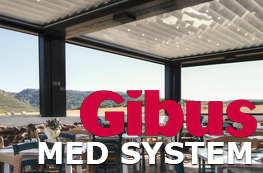 The basic system allows rainwater to flow freely off the sides and protect customers underneath Variations of the Isola Fly system allow for greater flexibility in installation with lighting, heating and different profiles for aesthetic purposes. 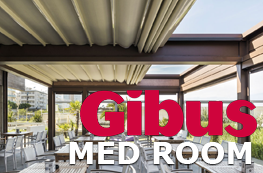 The more enhanced retractable roof systems we offer have higher specification framework systems allowing the use of additional products to the sides and front such as vertical outdoor blinds or sliding/folding glass doors creating a complete ‘outdoor room’ where you are protected from the worst weather with no rain ingress from the sides possible. 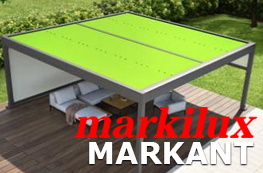 Another benefit of this type of system is the ability to open the roof only and keep the sides closed when the weather is fine but it may be windy, like a ‘convertible room’. The rainwater is collected inside these systems and directed down some, or all of the supporting legs, to be drained away as required. 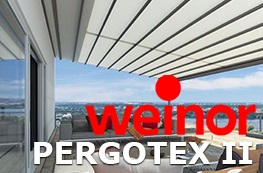 These systems will also have an even higher wind rating as of course the main framework is a permanent fixture, even though in building terms it is a ‘temporary structure’ with no thermal ratings or foundations required like an extension would have.